Having already generated great interest upon the release of singles High Rise and Paid Your Price, both gaining heavy rotation on alternative radio across New Zealand (and topping both the 95bFM Top Ten and TheAudience.co.nz chart), Null Hour continues the ideas set in place by Ryan Harte, Luke Kavanagh and Craig Rattray - a venture into audible space and resonance. A vast shift away from their previous moments as Tiddabades, Sunken Seas have cut their teeth in the local music scene, going back to basics and climbing the musical ladder from the ground up. It shows; their meticulous live performance has become every bit as strong as their musical output, leading to support the likes of Wooden Shjips (USA) and John Cooper Clarke (UK). 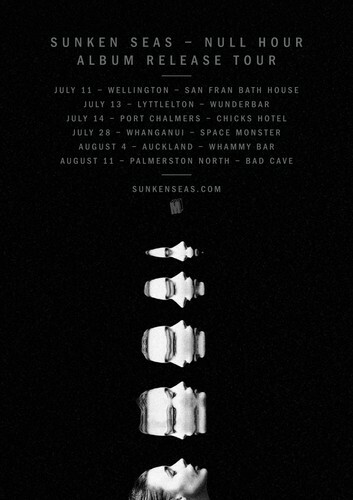 Come July, the three piece take to the road and play six dates across New Zealand in support of their debut release, available from June 28th through MUZAI Records in NZ.